Real Estate | Commit Marketing | A Full-Service Marketing, Web Design & Development Firm Located In Sarasota, FL. 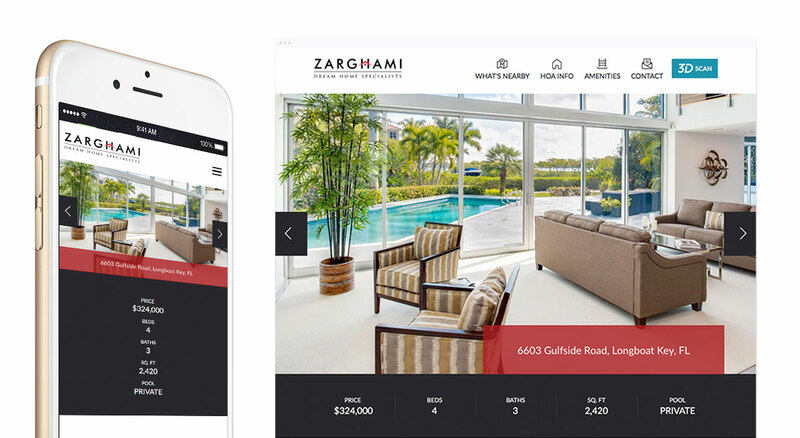 Zarghami Dream Home Specialists is growing their reach in the Sarasota and surrounding areas, and we joined forces to bring some marketing goals to the digital realm. Paired with the needs of our client, our research showed that while there are no shortage of ways to promote and feature listings outside of the run of the mill MLS listings — they didn’t take advantage of mobile demand and ease of use. Many were just repositories of listings that existed elsewhere without the option to include (or not include) branding or highlights unique to the property. Our plan was to develop a solution that allowed for the creation of fully-customizable navigation for each and every featured listing. Next, we defined what content would be included in this web solution—and what wouldn’t. We knew the exclusive interviews with David and his team gave us a in-depth view of their need for this end product. This allowed us to capture their vision both visually and on how their website functioned for both his team and the end user.